You can see the last fold in the top.When you want to fill the Pullman properly you have t account for the spring too so that it sprigs to perfectly fill the pan as it bakes and the crumb is nit compressed as a result. This one Lucy calls the 20%’er. It has 20% whole grains made up of home milled red and white wheat, oat and rye and 20% each of spelt, durum and Bob Red Mill Artisan Bread flour and LaFama AP. We went back to sizing the loaf to perfectly fit the Oriental Yippee Pullman pan that is our favorite pan by far. This one had a 10% pre-fermented Bran / flour, 100% hydration levain that was single stage that took 6 hours to double on the heating pad using our 2% (12 g), ancient aged, NMNF rye starter. I say ancient because we hardly bake at all anymore and this was nearly the last of it and I used what was left in the container to refresh it. So, it had to be at least 4 -5 months old with no maintenance in the fridge. You can see how the steam condensed on the lid and then ran down the insides of the pan and darkened the top all of the loaf on the sides - So water does darken bread once it can evaporate in the heat when not contained by the pan anymore. The one thing Lucy live more than me is being lazy and she is really, really lazy and now limps like her Master but her limp is going away and mine is not probably because she still drinks Tequila shots and Boilermakers just about every day. We then did a set of stretch and folds and some slap and folds to tighten it up and to get it into a roll shape and put it into the pan release sprayed pan with the lid on – also on the heating pad covered with the towel. It sat there looking lonely and doing nothing that we could tell since the lid was on for 2 hours. So we put it in the fridge for a 12 hour retard to punish it mightily and teach it a cold lesson of what happens to you if you do nothing like Lucy. This might be what caused Lucy’s stroke come to think about it. It was a cold winter and she did go outside without a coat or her hip flask she fills with brandy. Well the cold did nothing for this dough and it showed. We put it o the heating pad to do a final proof and it took a few hours – about 5 to rally get up to the lid of the Pullman and that was when we tossed it into a 475 F oven, turning it down immediately to 450F. after 22 minutes of steam we took the lid off and baked it for another 21 minutes until it hit 206 F on the inside. It really browned up well and filled the Pullman perfectly coming out like brick and just as crunchy on the outside too. My wife just asked Why I burned her bread? It is cooling now, softening and when cool we will wrap it in plastic and let it really soften the crust before we slice it for toast tomorrow. It smells fantastic which is great because we didn’t have to pay extra for that either. Amazing how you filled that Pullman perfectly! I can’t wait to see the crumb! So sorry to hear abut the loss of your old apprentice. I know you got a new one to train not long ago but the loss of a good old friend is difficult at best. Lucy is feeling better but didn't want to get out of bed or eat her breakfast this morning so we lid around until later and then she felt better and finally ate but has a bad stomach for sure. She still seems to be recovering well though. Filling the pan perfectly is just math, science, bread know how and a lot of luck! Glad you like the bread Danni and sorry for your terrible loss. Happy baking with the new apprentice! It is the hardest part about living with our furry companions and it's never easy no matter old they are. I'm sure a wise guy like you understands the importance of keeping Mrs. B happy. I would be very happy if someone makes me a perfect Pullman loaf like yours. How much rise did you expect from this combination of flours when you calculated the final dough weight? Re: condensation. Would rotating the loaf or baking it out of the tin in the last 10-15 minutes get rid of the (lighter) watermark and even out the darker side? Just a thought. Looking forward to seeing the crumb shot! Happy Pullman loaf baking, Dab! BTW, that juicy pork chop makes me drool! And I'm imagining how sweet those home-grown ? cherry tomatoes taste! I never had much luck with fish. When my daughter was young we got her an aquarium for her and stocked it but she never took to them and wouldn't clean the aquarium so they died. She did like her Gerbil but it got out any previous apprentice to Lucy; Gretchen, ate mot of it, Doxies are ratters after all and Gerbils qualify. My daughter was so upset her pet got out and we never could find it. We couldn't tell her that Gretchen ate it until she was in college and out of the house and Gretchen had died. For years, Gretchen would go into my daughter's room and sit by her dresser where the gerbil cage had been, looking up just waiting for the next snack. I didn't put it on the post but I did take the loaf out of the pan 8 minutes after the lid slid off, at the 23 minute mark and finished it on the stone to brown up the sides so I don't know how to top the condensation from darkening th top of the sides like it always does in a Pullman. The crumb really came put nice with this one and it taste great! Your Pan makes killer bread no matter what i put in it! Happy baking Yippee. Maybe it is time for a pond and Koi? I'm still getting used to my Pullman (only had it a week). How do you get such a perfect square? When my loaf bakes it forms a dome. Is it all in the proofing? Any advice on shaping? Say the water weighs 2,200 grams. That is your starting point. Now you need to figure put what kind of bread you are going to make and how much you expect it to proof and spring total. For a white bread with 20% whole grains I would expect it to rise and spring 100% total, So the dough that goes into the pan would be half the weight of the water or 1,100 grams (2,200/2) where the dough is 100% and the rise and spring is another 100% or 200% total. Since I was making a 75% hydration bread I divide the 1,100 grams of dough required by 1.75 to get 629 g of flour total making the water 471 g for the mix to fill the pan perfectly allowing for a 90% proof and 10% rise. In this case I over proofed it to 98% but, since I did, it was only going to spring 2% as a result and still completely filling the pan. In the UK you would have to know what to expect from your flour that has less gluten spring and riseability. Lets say that your flour of the same kinds would only rise 75% and only spring 10% than you would divide the 2,200 by 1.85 and get 1,189 g of dough required. When I make a 100% rye bread I figure the dough is going to rise 60% and spring 10^ so divide the weight of water by 1.7 to get the right dough amount..
You can do the same calculations for any pan but if not a Pullman then you want the dough to rise 10% over the rim of the pan and not be flush with it. So if the water filled the pan to 2,200 g then you would take that times 1;1 and fill the pan with 2,420 g of dough to get it to be exactly 10% above the rim of the pan when baked. My bread forma a dome too but when it bakes it runs into the lid which flattens it out :-) If you put too much dough in, it will squeeze itself out from under the lid and make a mess. You will still get a perfect cube but the crumb w'll be more compressed and less open than it should be. I shape it just like a squat batard that fits the length of the pan usually although I didn't this time and just used stretch and folds to shape.. Sorry, been wanting to say that for months! I guess you need to have grown up in the US in the sixties to remember the jingle. Lovely loaf, dab and the crumb is gorgeous! Hope Mrs B is happy with it. Brylcreem /ˈbrɪlkriːm/ is a British brand of hair styling products for men. 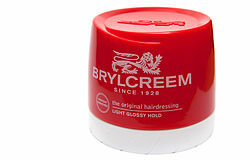 The first Brylcreem product was a hair cream created in 1928, by County Chemicals at the Chemico Works in Bradford Street, Birmingham, England. The cream is an emulsion of water and mineral oil stabilised with beeswax. It was first advertised on television with the jingle "Brylcreem — A Little Dab'll Do Ya! Brylcreem — You'll look so debonair. Brylcreem — The gals'll all pursue ya; they'll love to run their fingers through your hair!" Another version was: Brylcreem a little dab will do ya, Use more only if you dare; But watch out! The gals will all pursue ya, They'll love to run their fingers through your hair! Throw some cheese in between 2 slices and melt away! We like ours a little on the dark side anyway! Nice bake as always. I have to make another sandwich bread as well. I think I'm going to sprout some grains for the next one. Hope Lucy is feeling better and staying out of the cold! and pick up sticks in her coat as she rolls around. She does not like it when I take them out and bites me. I used to bare my teeth and growl at her when she did that but ,now that she is deaf. I just have to bare my teeth:-) It doesn't do anything and she isn't affected by it at all. She is a very determined German. Glad you like the bread Ian and sprouted grins will get the wife on our side for sure, not that she isn't. Lucy sends her best to the frozen black ones and hopes that they get some sun soon.